There are currently over 34 million gamers in the United States that play video games for an average of 22 hours a week, according to BGR. With so much time spent in front of a screen, digital eyestrain is a common problem experienced by many gamers. According to Mayo Clinic the symptoms of eye fatigue are sore or irritated eyes, dry or watery eyes, blurred or double vision, increased sensitivity to light, difficulty focusing and pain in the neck, shoulders or back. If not treated properly, eyestrain can lead to recurring headaches and migraines. The first thing you can do is ensure that the distance from your screen is a proper length away so you eyes don’t have to work too hard while you play. For a PC gamer, this means that the monitor should be directly in front of you at an arm’s length away, which is about 18 to 28 inches. Next, the top of the screen should be just below eye level. 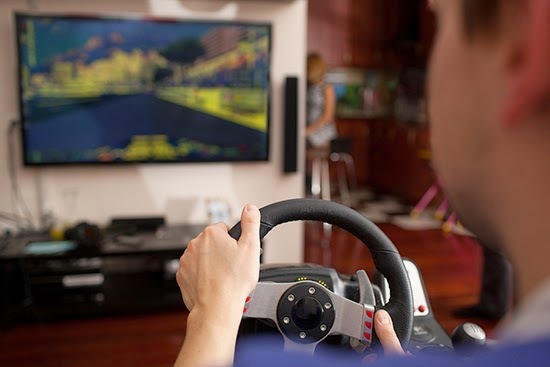 For a console gamer, the distance you sit from your television should be twice the length as the size of the screen. So, if you play on a 50-inch screen, you should sit a little over 8 feet away. Mayo Clinic recommends adhering to the 20-20-20 rule, which states a person should look away from their screen every twenty minutes for at least twenty seconds at an object that is at least twenty feet away. This helps the eyes refocus and recharge during periods of extended use and helps your blinking cycle return to a regular rate. Remember, the rule is a general guideline, so find what works for you. Stopping every thirty minutes instead of twenty will still be much more beneficial for your health than playing for four hours straight. Blue light comes from computer screens, mobile devices, indoor lighting and even from the sun. Blue light is on the low end of the visible light spectrum, meaning it has a shorter wavelength and produces a higher amount of energy than colors higher on the spectrum. Exposure to blue light could cause damage to a person’s eyes after extended periods of time, states Blue Light Exposed. Medical professionals also recommend staying away from blue light 2 to 3 hours before going to sleep as it can promote insomnia, according to WebMD. One way PC gamers can deal with blue light is to install a program that changes the color of the light coming from your monitor. For instance, the program f.lux slowly shifts the color of your screen depending on the time of day. Another solution for blue light is to purchase blue light blocking glasses. You'll also want to make sure the room you game in has the proper amount of light. If your screen or monitor is the only light in the room, add another light source to the mix by allowing natural light to come through a window or turning on a lamp. However, if the light from the window produces glare on your screen, install shades that reduce the glare without blocking out the sun. Even if you observe the 20-20-20 rule, it’s important to stop and take a break after extended periods of game time. Stand up, walk around, get a glass of water or walk outside for a few minutes. There are many apps that remind you to take breaks. One of the more popular ones is called Awareness, which works for both Mac and PC. Awareness reminds you to take a break based on time increments you set and even monitors your app and browser usage during the predetermined breaks to keep you honest. If you try all of these tips and still experience symptoms of eyestrain, contact your doctor to seek professional advice.